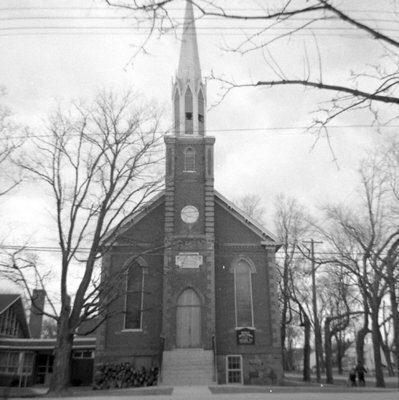 A black and white photograph of Brooklin United Church. Brooklin United Church is located at 19 Cassels Road East. It was built in 1867 on the south-east corner of Mill Street (Cassels Road) and Princess Street as the Brooklin Methodist Church. In 1925 it became the Brooklin United Church. Brooklin United Church, April 11, 1966, Brian Winter. Whitby Archives A2013_004_275.